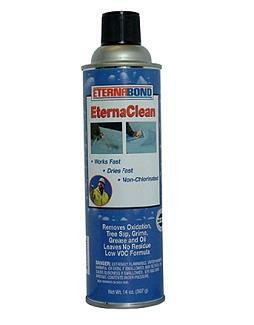 DESCRIPTION: Made by EternaBond and recommended for use on EPDM or TPO Roofing membranes. Cleans surface for application of RoofSeal, Webseal, DoubleStick, M1 Sealant or any of the EPDM peel/stick type products. Also used on seams before welding TPO/PVC seams. CAUTION: Flammable. Grime, Shoe or Finger Prints. All Single-Ply Roofing (except PVC). Metal roofing (including Kynar and siliconized paint). Limitations: May craze some plastic surfaces.